Stage & Screen: Was Jesus A Black Man? The new documentary Jesus: The Complete Story, co-produced by the British Broadcasting Corporation (BBC), tackles some of the myths and mysteries of the Son of God. Described as a purely scientific investigation, the film hopes to answer questions like "Was Jesus dark-skinned?" The three-part series, which began April 1 in Britain, will be aired in its entirety in the U.S. on April 15 on The Discovery Channel. During the program, a computer-generated image is created by a forensics artist using the 2,000 year-old skull of a Jewish man from Israel to show what Jesus might have looked like. The result has been described as a dark-skinned, round-faced, curly-haired man with a stout nose. In March 1931, two white women stepped from a box car in Paint Rock, Alabama, to make a shocking accusation: they had been raped by nine black teenagers on the train. So began one of the most significant legal fights of the 20th century. The trial of the nine falsely accused teens would draw North and South into their sharpest conflict since the Civil War, yield two momentous Supreme Court decisions and give birth to the civil rights movement. 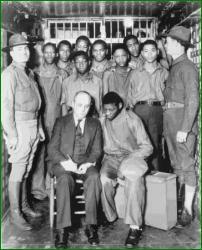 In addition to its historical significance, the Scottsboro story is a riveting drama about the struggles of nine innocent young men for their lives and a cautionary tale about using human beings as fodder for political causes. Andre Braugher narrates the 90-minute PBS program on April 18 at 8 p.m. and on April 22 at 10:30 p.m.
Why in 1994 did the Afrikaners of South Africa surrender power and why did the huge African majority accept a non-vindictive transition to democracy? Seven years later, the question is, how can the new democracy of South Africa hope to overcome its enormous divisions and problems and avoid the fate of other deeply divided societies? Distinguished American diplomat Donald F McHenry narrates this one-hour PBS documentary on April 26 at 8 p.m. The program includes interviews with prominent persons in politics, business, religion, medicine, labor, academia and the arts as well as ordinary citizens.